Wow! This recipe by Hellmann's/Best Foods sounds too good to be true - with it's 4 ingredients, 5 minutes of prep time and 20 quick minutes of baking time - but it's totally true and totally amazing! Even my husband who is not a fan of mayo (a key ingredient in this recipe) absolutely raved about this dish and cannot wait to have it again. In fact, I wanted to take a picture of him enjoying it but he devoured it before I could grab the camera! Hellmann's, or Best Foods Real Mayonnaise as those of us on the west coast know it, really knocked it out of the park with this recipe. Think juicy, moist, tender and incredibly tasty. Don't let the limited number of ingredients fool you. 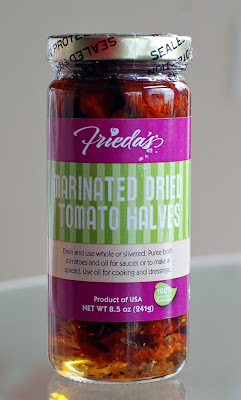 Their mayo gives it all the richness in flavor you could desire. 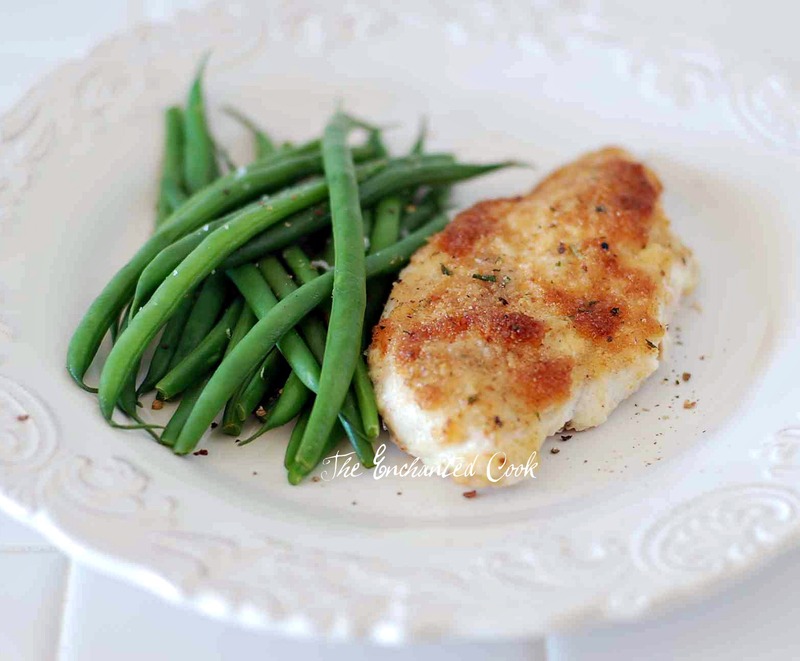 Parmesan Crusted Chicken in well under 30 minutes. Really!! So amazingly moist and rich! Place mayo and cheese in a small bowl and mix. Lay chicken breasts on baking sheet (I line my baking sheet with parchment paper to make clean up easy) and spread mayo mixture evenly atop each. Next evenly sprinkle bread crumbs atop each. Place in oven and bake for 20 minutes or until chicken is cooked thoroughly and juices run clear. Tops will be browned and chicken will be incredibly juicy. You can also finish them off under the broiler for a minute or two to get them extra browned on top. Season with a dash of fresh cracked pepper and sea salt, if desired. 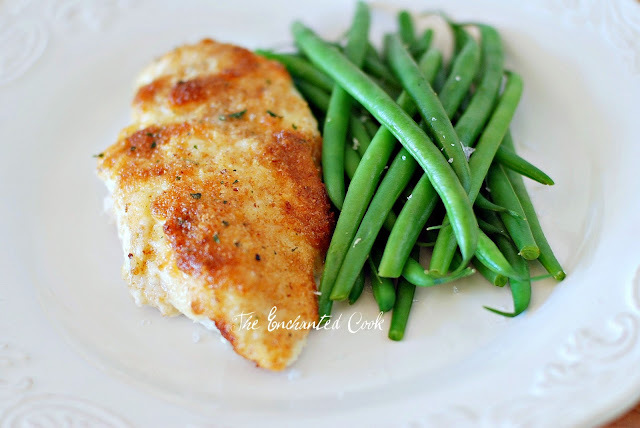 Serve with a veggie like these delicious fresh french green beans that I steamed. I use chicken cutlets that I buy at Gelson's - the thin ones - or you can just butterfly a normal boneless breast and that will yield 2. You can definitely use normal boneless breasts, just increase your cooking time by at least 10 minutes (original cooking time for thin cutlets is 20 minutes, so for thick boneless breasts cook them at least 30 minutes, or until they are no longer pink inside/fully cooked). I've used light mayo (and just about every form of mayo there is) and it comes out fabulous every time. Many of you have said you've experimented by using yogurt (Greek, plain, 0%, or light), and/or sour cream (regular or light) in place of the mayo and had great results. If you choose to substitute, especially with 0% Greek yogurt, consider adding some fresh squeezed lemon juice, garlic powder, and some extra salt and pepper to the mix to amp up the flavor. This was a sponsored post. The opinions expressed herein are my own and were in no way influenced. This recipe is awesome! 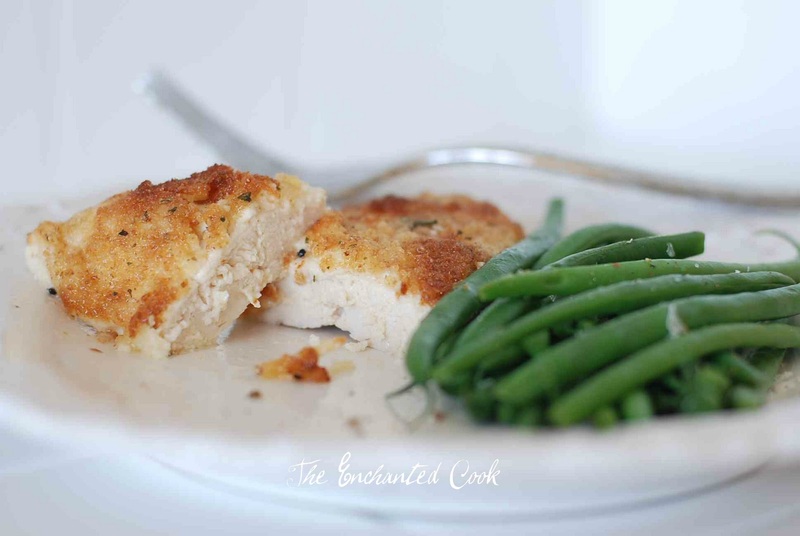 If you like this recipe, check its healthier Paleo, Keto and Bulletproof cousin Parmesan Crusted Halibut! Talk about quick, easy and satisfying. This dish has it all. I used frozen peeled and deveined wild caught shrimp and whole wheat linguini - both cook very quickly. And I used jarred sun-dried tomatoes plus the oil they were marinated in so this dish came together in under 20 minutes. One of the other things I really love about quick pasta dishes like this is that I can whip it up for lunch for one, or easily increase the ingredients to accommodate as many servings as needed. In this case I made enough for 2 for dinner. In a large skillet over medium-high heat place half the oil from the jar of marinated sun-dried tomatoes plus butter. When heated add the garlic and cook for about a minute until garlic is fragrant, then add shrimp, sun-dried tomatoes and sprinkle with sea salt. Cook for approximately 1-2 minutes per side until shrimp is opaque and cooked through. Add cooked pasta to skillet along with small amount of reserved pasta water and toss. Season with additional sea salt and fresh cracked pepper. Place in bowls and garnish with fresh parsley and Parmigiano-Reggiano and serve immediately with a small salad or green veggie. The incredible, edible...fig! As delicious as it is beautiful. As versatile as it is mysterious. I was thrilled when the California Fresh Fig Growers Association offered to send me some fresh figs to play with. I've long been a fan of them. Recently in the form of Pancetta Wrapped Figs, and Brie with Fig and Almond, and as a child when my mom used to make homemade fig bars - her version of Fig Newtons. So what is a fig? A fig is a fruit and it grows on a tree. It's smooth on the outside and soft on the inside with lots of edible seeds. You can eat the whole fig raw, skin and all, or you can prepare figs any number of ways - from sweet to savory. 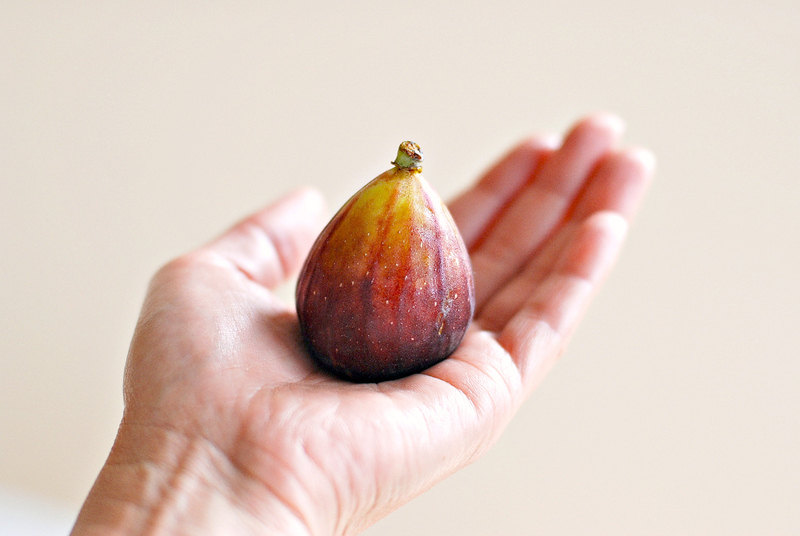 Figs are typically small, about the size of a golf ball or slightly larger. 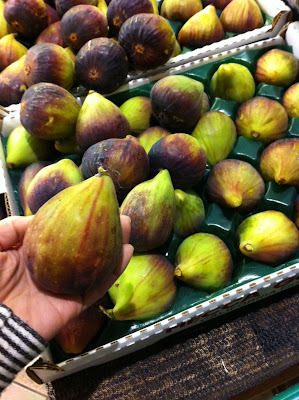 Although last year at Bristol Farms I saw figs the size of my palm! Unusually large figs I saw last year at Bristol Farms! Figs have a distinctive flavor. They're mildly sweet without being overly so. 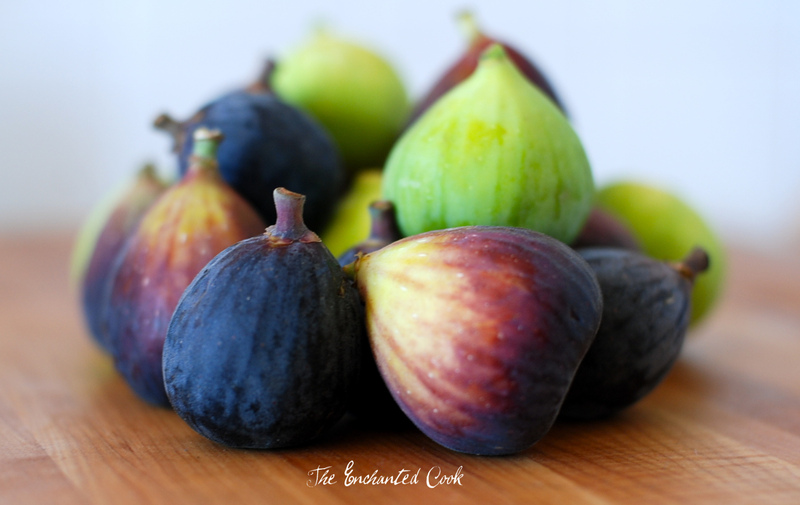 The darker figs, like Black Mission Figs are richer and earthier, while the lighter colored figs, like Calimyrna Figs are more buttery and nutty. Dried figs are similar to the texture of prunes and taste somewhat like the inside of a Fig Newton. 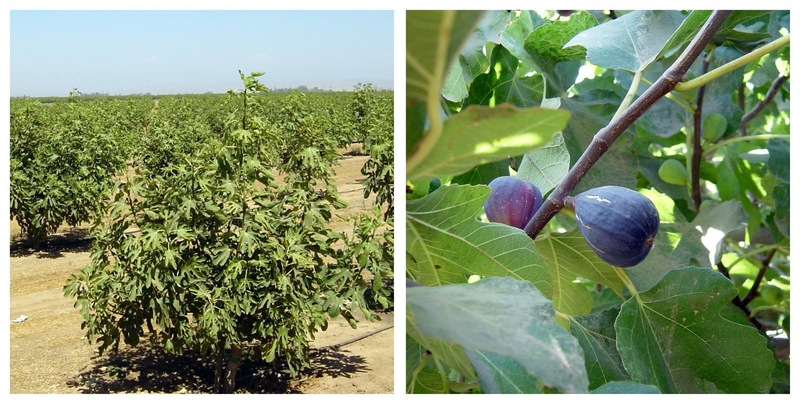 Did you know that California produces 100% of the United States' dried figs and 98% of our fresh figs? And in CA there are 5 primary varieties of figs - Black Mission, Calimyrna, Brown Turkey, Kadota, Sierra Figs. In most stores here locally in Southern CA, I generally find the first 3 fresh figs - Gelson's currently has fresh Black Mission and Brown Turkey Figs, and Bristol Farms has fresh Calimyrna Figs. The dried figs I usually find are Black Mission Figs. Figs are naturally fat free, sodium free and cholesterol free as well as being rich in antioxidants, fiber, potassium and calcium. They're an all-natural energy source making them perfect for an afternoon snack or a quick boost before a workout! Figs are a wonderous and versatile ingredient. This time I chose to use fresh (but you could also use dried) figs in a beautiful stuffed pork loin roast. Place goat cheese, cooked and diced pancetta, minced shallot, leaves from one sprig of rosemary, a pinch of sea salt, and a bit of fresh cracked pepper in small bowl and mix. Next add figs and gently mix. Set aside mixture and prepare pork loin. Cut large slit or pocket in middle of pork loin roast being careful not to cut through the ends or filet. Place mixture inside the pocket. Close up pork loin and hold together by tying several pieces of kitchen twine around. Then coat with sea salt and fresh cracked pepper. Heat up oil in a skillet to high heat. Place pork loin in and sear all sides. Place pork loin in baking dish and roast in oven for approximately 40 minutes or until internal temperature reaches about 140 degrees F. Remove from oven, cover with foil and allow to rest approximately 15 minutes or until internal temperature reaches 160 degrees F.
Slice, garnish with fresh rosemary and serve. Yum - rich and full of flavor! 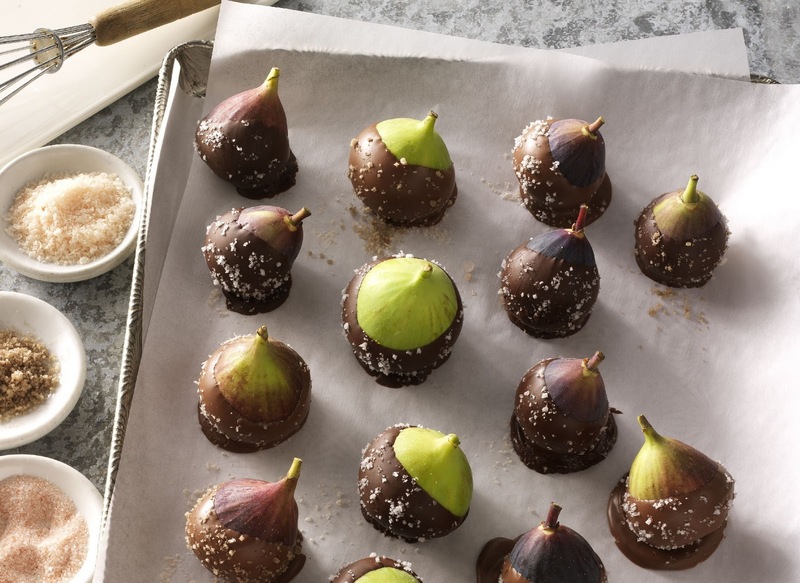 For more recipes using fresh and dried figs, like the one below for Chocolate Covered Figs, visit: www.calfreshfigs.com and www.californiafigs.com.